A Visit to a Countryside Farm…. | Shivani Singh…..
A Visit to a Countryside Farm…. This is an account from-15th Feb 2014. Waking up to a bright sunny morning was an absolute bliss today. The sun rays sneak peeked through the chic dressing the window, and eloped into the duvet as though teaming up for more warmth! I jumped out of the bed and rolled up the chic for more might of the sun. Confirming it to be a momentary change, I looked up the weather report on my phone. It felt like a festive excitement- to note that temperature would range from 8 degrees to 16 degrees, with a clear bright sky! 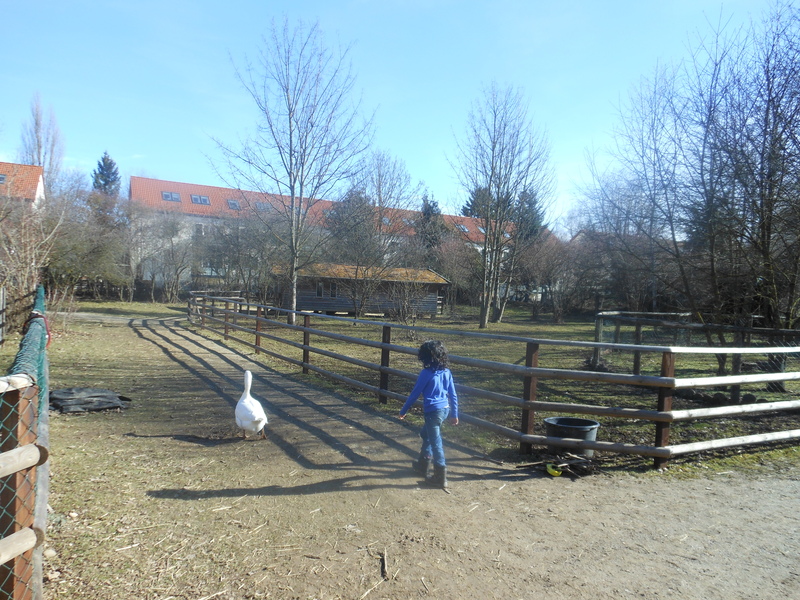 My daughter’s love for running around hens and geese, made me plan a visit to a farm in the suburbs of Munich. I’m personally a lover of places- full of people in chaotic order! But, even though, this farm was far from the madding crowd, the moment we entered- I kind of slipped into its countryside exuberance. I walked all around, as the strong scent of the woods filled my nostrils. There was a kind of vibrancy in the quietude of this place that fondled my vivacity. The quacking of the ducks, the clucking of hen and the cackling of geese with the splashing sound of water- made by the playful flapping of their wings- were all playing like symphony to my ears! The huddling of the sheep was so much like the team huddles- I witnessed, while at work, or while watching sports, or kids ganging up against their assumed opponents! And, as I kept treating myself by walking further down into the farm- the petite sun-bathing rabbit under the tree, the neighing horses, the smell of the haystacks, the smoky aroma of the food being cooked by the farm owners- it all manifested life’s vitality in its own unique style. It seemed like a pristine day, spent in all its grandiosity with nature! While narrating this experience, I’m also so strongly and amusingly, reminded of those many similar mornings that I woke up to and spent anyhow- for years while I got it. You must be thinking, what’s this woman up to- talking about bright sunny morning as though it’s some exquisite phenomenon! Actually, it does sound mundane- but only till we live for days without it! And then, we realize how fortunate we have been in waking up to a bright sunny morning- every single one of those days! I marvel at nature’s way of teaching! Makes me humble enough to welcome its kindness for as long as it’s benign, and approach every single one of the coming days with full zeal for life- till its last sleepy hour!!! This entry was posted in Reflective Experiences... and tagged The Grandeur of Nature! by shivanisingh9. Bookmark the permalink. Extremely helpful info specially the remaining phase 🙂 I care for such info much.